He's only eight films in and yet it feels like Quentin Tarantino has been making films since they were invented. It's probably because he's tried every genre under the sun and pays homage and even copies film after film and yet every single movie he makes is undeniably his own. 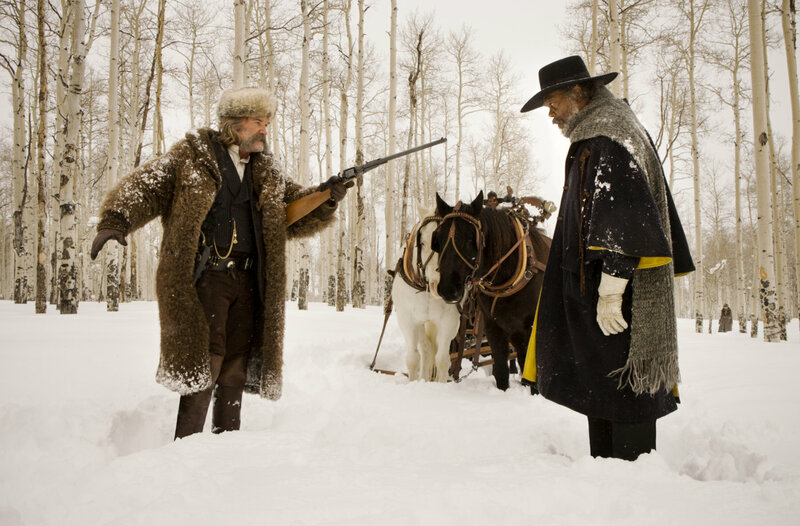 “The Hateful Eight" is no different. His third film set in the historical past might actually be his most ambitious yet for he has the cojones to set his nearly three hour film in a snow covered wagon and then in one room the whole time. He even doesn't mind that his characters spout out the N word over and over again. Of course the film is set just a few years following the Civil War. And the entire film can be read as an allegory of this country's complicated (and unfortunately still complicated) relationship with racism; obvious leftover sentiments from his slavery blaxploitation extravaganza “Django Unchained.” The film is of course extremely fun – once it's plot becomes clear it's essentially a whodunit mystery dressed as a western. When you see a Quentin Tarantino film you should be prepared for several guaranteed situations: long scenes of talky dialogue and over-the-top violence. The Hateful Eight has those scenes in spades. It doesn't disappoint. What's so fascinating is how all of this remains so fascinating even though there isn't much changing scenery. Essentially Tarantino has delivered his most play-like film to date. Which feels ironic that it also feels like his most cinematic: he and cinematographer Robert Richardson broke out the old school film cameras and shot the whole thing in large format 65mm film. The film basically has two locations. The first hour or so is set inside a cold horse drawn carriage as bounty hunter John “The Hangman” Ruth (Kurt Russell at his most Kurt Russelly) is escorting female prisoner Daisy Domergue (Jennifer Jason Leigh) which has instantly become one of my favorite character names ever. They come across another bounty hunter and former Union soldier Marquis Warren (Samuel L. Jackson) who's escorting some dead bodies. They're instantly suspicious of each other which sets the tone for the rest of the film. With a bad snow storm on their tails, they hole up at a local haberdashery and seek shelter with the other fellas there. It's a bunch of other fishy characters… and they're, also hateful. Leigh instantly stands out for two reasons. First of all, she's pretty much the only female character in the film which feels weird since Tarantino does usually feature some pretty awesome women in his films. He puts all of his talented and bizarre energy into this zany character who speaks very little but yet says so much. Of course nothing is quiet coincidental in this type of film and soon a mystery brews and characters are picked off as if it were an 80s slasher film. There are surprises, crazy revelations, and in true Tarantino fashion a non-traditional narrative structure. Just because a character dies doesn't me they won't appear in the rest of the film. Every actor his is at the top of their game including past Tarantino staples Tim Roth, Michael Madsen, Bruce Dern, and newcomers Walton Goggins and Demian Bichir who round out the hateful eight. Richardson's photography is gorgeous and Ennio Morricone's first Hollywood original score in years is delightful. Trailer for The Hateful Eight on TrailerAddict.